Marjory Kennedy-Fraser published her first volume of Hebridean songs in 1907 and Bantock was hooked almost from the start. He was particularly involved in the compilation of her second volume which was published in 1917, and to which he contributes a high-flown and ecstatic introduction describing a visit to the islands in summer. 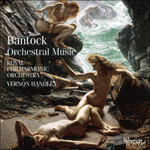 Bantock used these tunes in various works, notably his Hebridean Symphony first performed in 1916, and his chamber opera The Seal Woman first seen in Birmingham in 1923. Caristiona is a setting for small orchestra of the song of the same name from Kennedy-Fraser’s second volume. Caristiona is noted as collected by Frances Tolmie with words collected by Kenneth Macleod, and Bantock prefaces his score with Macleod’s summary of the story. The Lady of Clanranald sat on the shore of Moydart watching the setting sun, and as she watched, she saw with the keen eye of a mother’s love and a mother’s pain, two ships sailing through the Western Sea. From the one, though sailing seaward, came the sounds of harping and of song, and of a bride’s laugh that was sweeter than both – while from the mast-top waved the Clanranald badge, a spray of purple heather, fresh with the bloom of the hillside. From the other ship, though sailing homeward, came the sound of the croon and the keening for the dead – the bride of yesterday – the one-no-more of tonight – while from the mast-top drooped and withered a spray of purple heather. Behind the Bens of Rûm the sun had set, but the Lady of Clanranald sat on the shore of Moydart, wailing a mother’s wound to the night and the sea. No answer tonight – the wound! The wound! But only the night-hag answered, and the far-away keening of the western sea. Bantock’s manuscript is dated ‘Birmingham 28 November 1920’, but was later revised and re-orchestrated in January 1944, with Bantock’s orchestral setting of The Sea Reivers, as Two Hebridean Sea Poems in response to Sir Henry Wood’s invitation for a work for the 1944 Proms. Here we play the original version for a small orchestra of double wind, four horns, trumpet, harp, percussion and strings. Marjory Kennedy-Fraser publia son premier volume des Chants des Îles Hébrides en 1907. Pour Bantock, ce fut une révélation. Il s’investit particulièrement dans la compilation du second volume qui parut en 1917 pour lequel il contribua d’une introduction ambitieuse et extatique décrivant une visite aux Iles Hébrides durant cet été-là. 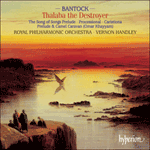 Bantock exploita ces mélodies dans plusieurs compositions, notamment son Hebridean Symphony exécutée pour la première fois en 1916 et pour son opéra de chambre The Seal Woman dont la première eut lieu à Birmingham en 1923. Caristiona s’agit d’une musique pour un orchestre modeste sur la mélodie du même nom que l’on trouve dans le second volume de l’ouvrage de Kennedy-Fraser. Il est indiqué que la musique de Caristiona fut notée par Frances Tolmie et le texte par Kenneth Macleod. Bantock préface sa partition du résumé de Macleod. La Dame de Clanranald s’est assise sur le rivage de Moydart regardant le coucher de soleil. En pleine contemplation, elle aperçut avec l’œil ému d’une mère aimante et d’une mère affligée deux navires voguant à travers la mer de l’Ouest. Du premier, qui pourtant prenait le large, montaient les sons d’une harpe et d’une chanson, ainsi que le rire de la mariée, un rire plus doux que la musique, tandis que du grand mat flottait l’emblème de Clanranald, un bouquet de bruyère violette, frais comme les fleurs de la colline. De l’autre navire, qui revenait au port, s’élevait le son d’une lamentation et une déploration funèbre – la mariée d’hier – celle qui n’était plus le soir – tandis que du grand mat tombait flétri un bouquet de bruyère violette. Derrière les Bens of Rûm, le soleil avait disparu, mais la Dame de Clanranald restait assise sur le rivage de Moydart, reprochant ses blessures de mère à la nuit et à la mer. Aucune réponse ce soir – la blessure ! La blessure! Mais seules lui répondent la nuit ensorcelée et la déploration lointaine de la mer. Le manuscrit de Bantock est daté « Birmingham, 28 novembre 1920 », mais fut ultérieurement révisé et réorchestré en janvier 1944. Il fut exécuté en compagnie de la réalisation orchestrale de The Sea Reivers sous le titre de Two Hebridean Sea Poems en réponse à l’invitation de Sir Henry Wood qui souhait une œuvre pour les Concerts Promenade de 1944. Nous avons choisi d’interpréter la version originale pour petit orchestre comprenant les vents par deux, quatre cors, trompette, harpe, percussion et cordes. Marjory Kennedy-Fraser veröffentlichte 1907 ihren ersten Band mit Liedern von den Hebriden, und Bantock war von Beginn an davon begeistert. An der Zusammenstellung ihres zweiten, 1917 veröffentlichten Bandes nahm er regen Anteil und steuerte insbesondere eine schwülstige, verzückte Einführung bei, die einen sommerlichen Besuch auf den Inseln beschreibt. Bantock verwendete diese Melodien in verschiedenen Werken, vor allem in seiner 1916 uraufgeführten Hebridean Symphony und seiner Kammeroper The Seal Woman, die 1923 in Birmingham uraufgeführt wurde. Caristiona ist eine Vertonung für kleines Orchester des gleichnamigen Liedes aus Kennedy-Frasers zweitem Band. Zu Caristiona wird erwähnt, die Weise sei von Frances Tolmie gesammelt worden, der Text von Kenneth Macleod. Bantock stellt seiner Partitur die Zusammenfassung Macleods voran. Die Herrin von Clanranald saß am Gestade von Moydart und betrachtete die untergehende Sonne, und als sie hinausschaute, sah sie mit dem scharfen Blick, den Mutterliebe und Mutterschmerz verleihen, zwei Schiffe übers westliche Meer hinsegeln. Vom einen hörte man, fuhr es auch seewärts, Harfenspiel und Gesang und das Lachen einer Braut, das süßer ist als beides zusammen, und von der Mastspitze wehte das Wahrzeichen des Clanranald, ein Zweig purpurnen Heidekrauts vom Berg in frischer Blüte. Von dem anderen Schiff ertönten, fuhr es auch heimwärts, Trauergesang und Wehklagen für die Tote – die gestrige Braut, die heute abend nicht mehr ist –, und von der Mastspitze hing schlaff und verblüht ein Zweig purpurnen Heidekrauts. Hinter den Bergen von Rûm war die Sonne untergegangen, aber die Herrin von Clanranald saß am Gestade von Moydart und klagte der Nacht und der See das Leid einer Mutter. Keine Anwort heute abend – welches Leid! Welches Leid! Aber nur die Nachthexe antwortete ihr, und das ferne Klagen der westlichen See. Bantocks Manuskript trägt die Inschrift „Birmingham, den 28. November 1920“, doch das Werk wurde im Januar 1944 zusammen mit Bantocks Orchestersatz von The Sea Reivers unter dem Titel Two Hebridean Sea Poems überarbeitet und neu orchestriert, als Sir Henry Wood den Komponisten bat, ein Werk für die Proms 1944 beizusteuern. Auf dieser CD spielen wir die Originalversion für kleines Orchester mit doppelt besetzten Holzbläsern, vier Hörnern, Trompete, Harfe, Schlagzeug und Streichern.